•Names of two witnesses who are 21 years of age or over. Application form for special license can be obtained from Head Office of the Registrar of Births, Deaths and Marriages in Suva, the Divisional Registrar Offices either in Lautoka or Labasa or any offices of the district officer. This license is valid only for 28 days from the date of issue [within which the marriage may be performed] is stated in the license and the marriage officer should satisfy himself/herself that the license is still in force. 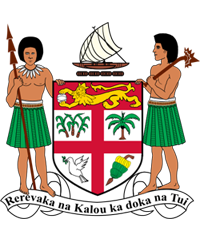 Marriages in Fiji are solemnized by Government Offices or Ministers of Religions of the Christian faith or other suitably qualified persons professing any recognized religion, must first be registered as a marriage officer. The names of all marriage officers are published in the Fiji Republic Gazette upon registration and then annually at the beginning of each year. The party who intend to get married should satisfy themselves that the marriage officer or celebrant assign to solemnize their marriage has already been registered. Should a party wish to be married in a garden, hotel and etc., arrangement should be made before hand with a marriage celebrant who will officiate the marriage. Traveling expenses for the celebrant should be met by the party concerned. •The duplicate copy of the certificate of marriage must be given to one of the parties, the original must be sent within seven days to the district registrar or Registrar General [in Suva] for recording purposes. Where the Registrar General or the district registrar has already performed a marriage, a marriage officer may, if the parties desires upon production of the certificate of marriage perform a further religious ceremony of marriage. No further certificate of marriage shall be completed by the marriage officer in the case of an additional religious marriage ceremony. All members countries that have adopted the Convention abolishing the requirement of legalization for Foreign Public Documents. This convention, opened for signature at The Hague on 5th October 1961 applies to public documents which have been executed in one country and which are required to be produced in the territory of another country. The convention have allowed and included documents such as Marriages, Births and Deaths Certificates are exempted from legislation of documents and the only formality required is the affixing of a certificate by a competent authority of the country from which the documents issued. This certificate or stamp is titled “Apostille” [convention de La Haye du 5 October 1961]. The Ministry of Foreign Affairs is equipped with the designated authority to certify public documents under the Convention. Please get your marriage certificate authenticated by the ministry of foreign affairs and External Trade before departure from Fiji. Outside office after normal office hours 8. •The special license is effective immediately after the application is received (within one working day) and processed by the registry. It is valid for 21 days from the date of issue. The fee is FJ$20.00. After the marriage ceremony it is advisable to apply for a proper/typed marriage certificate. This can be obtained from the local registry office at a fee of FJ$3.00.